Superintendent, Junior Superintendent (Publication), Assistant Mess Manager, Junior Assistant, Junior Assistant (Accounts), Senior Mechanic/ Sr. Laboratory Assistant, Junior Laboratory Assistant vacancies. Total available vacancies in this IIT Delhi Recruitment are 54 posts. Candidates must have to read the essential criteria before filling the application for desired post. Candidate should require to send application forms for IIT Delhi Sr. Laboratory Assistant, Junior Assistant Vacancies from 25-11-2017 to 11-12-2017 through online using the official website https://recruit.iitd.ac.in/recruitEII/. Selection for this IIT Delhi Junior Assistant, Sr. Laboratory Assistant/ Sr. Mechanic and other vacancies is based on written test & Trade Test/ computer Test. More details regarding Indian Institution of Technology IIT Delhi Recruitment of 54 Senior Mechanic/ Sr. 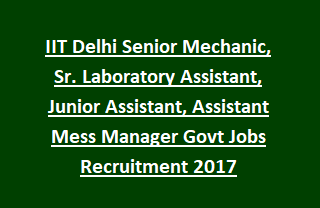 Laboratory Assistant, Junior Assistant, Assistant Mess Manager Government vacancy details are mentioned below. Total Available vacancies in Indian Institute of Technology, Delhi Recruitment are 54 posts. Senior Mechanic/ Sr. Laboratory Assistant: Master Degree in Science/ Computer Science Or Bachelor’s Degree in Science or 3 years Diploma in engineering with minimum 55% marks. Junior Assistant: Bachelor’s Degree in any discipline with minimum 55% marks. Please check the Delhi IIT notification for other qualification details. Indian Institute of Technology Delhi will conduct written test/ Trade Test/ Computer Test for short listing candidates for Jr. Assistant, Sr. Mechanic/ Sr. Laboratory Assistant and other posts. Go through the IIT Delhi notification for further selection process details. Application fee for OBC candidates is Rs. 50/- paid through SBI I-Collect. No application fee for SC/ ST/ PwD. Candidates are required to send application form for IIT Delhi vacancies through online using the official website https://recruit.iitd.ac.in/recruitEII/ from 25-11-2017 to 11-12-2017. Last date to reach the hard copy of application with self attested documents is 21-12-2017.